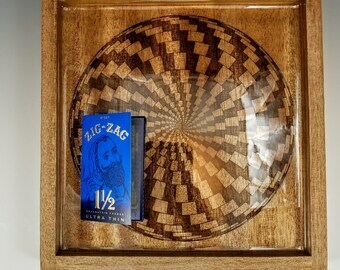 Announcement 1) Affordable Cannabis Themed Ideas, One of a Kind and Useful Gifts. 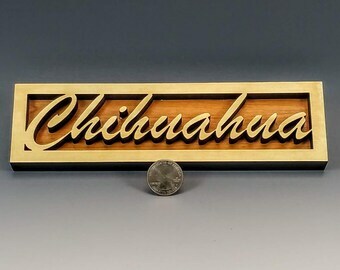 2) Custom Laser Engraving available on select pieces, tell me what you want !! 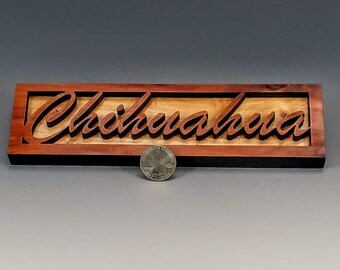 Please take a few minutes and check out some of the beautiful unique Cannabis themed ideas, Home Decor, Handmade Ornaments and Wood art that I make. I hope you'll be impressed. 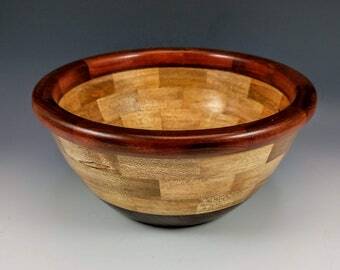 I carefully select colorful and unique pieces of wood that are then used to make my Ornaments, Segmented Bowls and other unusual designs. The natural variables in the wood nature provides makes for spectacular colors and textures which I so enjoy mixing, matching and gluing together, the final step is turning these amazing pieces of wood into one of a kind designs on my wood lathe. 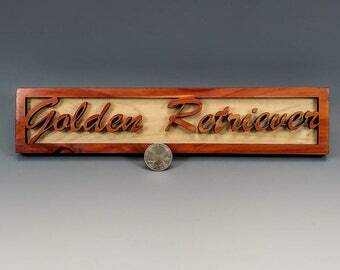 There are several types of finish I choose from depending on the intended use of the particular piece, from a shiny Gloss Lacquer to a Wax / Mineral oil for food safe bowls. I love to answer any questions you may have about my work or the woods I use, please feel free to contact me through the "conversation" option. 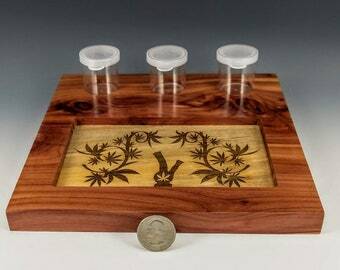 1) Affordable Cannabis Themed Ideas, One of a Kind and Useful Gifts. 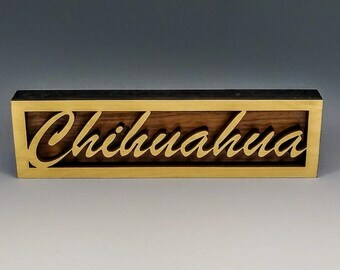 Golden Retriever Dog Signs, Animal Lover Gifts, Dog Decor, Great sign & Saw tooth Hanger installed, Golden Retriever . 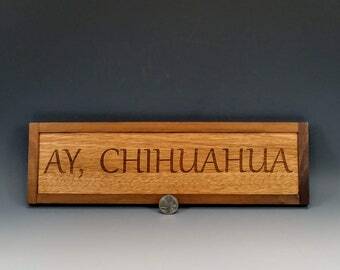 Handcrafted Dog Signs, Animal Lover Gifts, Dog Decor, Great sign & Saw tooth Hanger installed, No need to knock, we know you're here. This shipped out same day and got here quickly! I really appreciate the fine craftsmanship. The cap sits flush and the magnets are strong. I would recommend that Tim sand the insides down a little smoother, but I can't complain as this was a great purchase! I may have some custom work requests for you soon Tim. 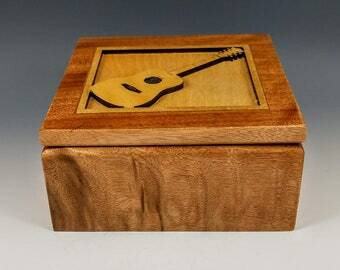 This is a beautifully made box. I love the tiny magnets holding the lid in place. Brilliant! Thank you! Thanks! Great transaction. I'll be back for sure. They say a clean work bench is the sign of a sick mind, if that's true ... I'm very well adjusted. One step in the process of creating an "Open Segment" piece. From an interest ... to a Hobby .... to a Passion .... to an Obsession. ..... a new chapter is being written as you read this. I'm filled with Endless Inspiration and limited only by time. 40 years in Honolulu then on to California for another 10 yrs. 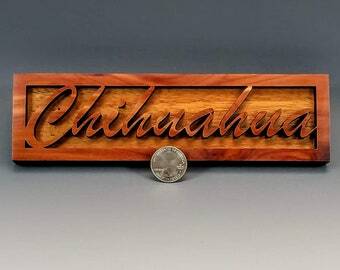 Now I'm in South Carolina and retired where everyday is an opportunity to further refine my wood turning skills. Hi ... Welcome to my shop, take a look around and find something you simply can't live without !!! 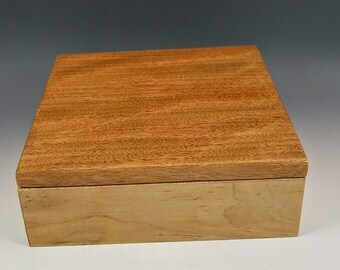 The pieces I have for sale represent many, many hours of material selection, milling, designing, turning and finishing. I hope you can see the result of my efforts in the unique designs and quality of workmanship I strive for with each tool I pick up. Feel free contact me with compliments, comments / critique. If the return request is due to an inaccurate description or a defect in workmanship I may at my description refund the return shipping. My goal is for you to be 100% satisfied. No excuses. I accept all major credit cards through direct check out, PayPal, and Etsy gift cards. Sales tax, if applicable is included in the price of my items. Shipment is made within 1-3 business days after payment has cleared. I have selected countries added to my International Shipping options. If your shipping destination is not listed as an option, please contact me so I can accommodate. Please be aware, any unforeseen Fees or Duty Charges will always be the buyers responsibility. I ALWAYS TRY AND COMBINE SHIPPING CHARGES INTO ONE BOX IF POSSIBLE, I'LL REFUND EXCESS COSTS AS APPROPRIATE. Depending on the size of the piece I may ship through the USPS or UPS, I'll do my very best to pack your purchase so that it arrives safely ... Each package we ship is insured. If a package arrives damaged, please send me pictures to confirm any obvious damage to the outside of the package before opening it if possible, and of course the condition of the piece you purchased once unwrapped and inspected. Your inspection process and contacting me must take place within 7 calendar days from the day you received the package. We will immediately take the necessary steps to address the issue. Please note, any package that may be mishandled or damaged during shipment will become my first priority until the case is resolved and both the Seller and Buyer are satisfied.